Cheim & Read is pleased to announce an exhibition of paintings, made between 1958 and 1963, by New York painter Milton Resnick (1917 – 2004). This is Cheim & Read's first exhibition of Resnick's work since obtaining exclusive representation of his estate in 2006. The extraordinary group of paintings brings together some of Resnick's largest canvases, and is the first time many of them, including the expansive Swan and Tilt to the Land, have been seen in New York since their showing at Howard Wise Gallery in the early1960s. The exhibition was made possible with loans from the Metropolitan Museum of Art, the Museum of Modern Art, New York, the Modern Art Museum of Fort Worth, and the Whitney Museum of American Art. The show is accompanied by a full color catalogue with an essay by Nathan Kernan. Milton Resnick was born in Bratslav, Ukraine and immigrated with his family to the United States in 1922. He began studying commercial art at Pratt Institute, but in 1933 transferred to the American Artists School to focus on painting. A first generation New York School painter, Resnick was friends with Arshile Gorky and Willem de Kooning and was an active participant in the artistic arguments taking place. The style he developed and refined between 1959 and 1963 became emblematic of his later painting and is an important turning point of his career. A defining characteristic of the paintings are their tremendous size: the work done during this time was the largest Resnick made until the late 1980s. Swan, 1959, measures 25 feet, and is one of the three biggest canvases Resnick ever painted. The paintings' size was in part determined by a 5,000 square foot studio Resnick rented in 1959, and the mental and physical space it provided. Importantly, the paintings' massive scale did not exceed the peripheral vision of the viewer—Resnick meant them to locate the viewer in space and, more significantly, at a place: "It isn't canvas that you approach for your focusing. It is a place…A very important part of this whole thing lies in whether this canvas, which becomes this place—also becomes a world." Like younger painters, such as Cy Twombly and Robert Ryman, Resnick worked in, through and beyond the language of NY gestural painting toward an intimate relationship with mark-making, the surface, and the physical matter of paint itself. Ultimately, the materiality of paint became paramount, and Resnick's intent dissolution of form resulted in ever more monochrome, thickly textured surfaces. 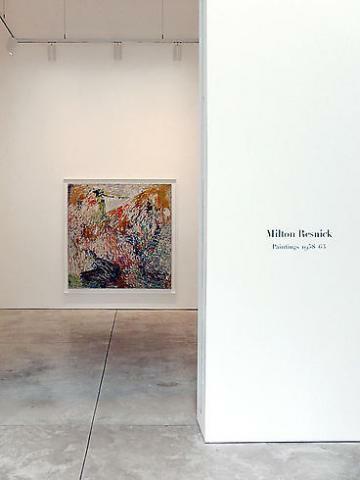 The transition of Resnick's work from more explicitly Abstract Expressionist modes to the monochrome paintings of his later years was a result of the marked exploration witnessed in this exhibition. A record of the physical and emotional boundaries of their creator, the paintings testify to an artistic evolution. Resnick stated: "Art is not a learning process. It is the very reverse of learning. It is the unhinging of your soul from your sight."